Today, I'm starting a new feature called 1001 Classic Movies You Should See with the romantic comedy, The Philadelphia Story (1940) starring Cary Grant, Katharine Hepburn, and James Stewart. 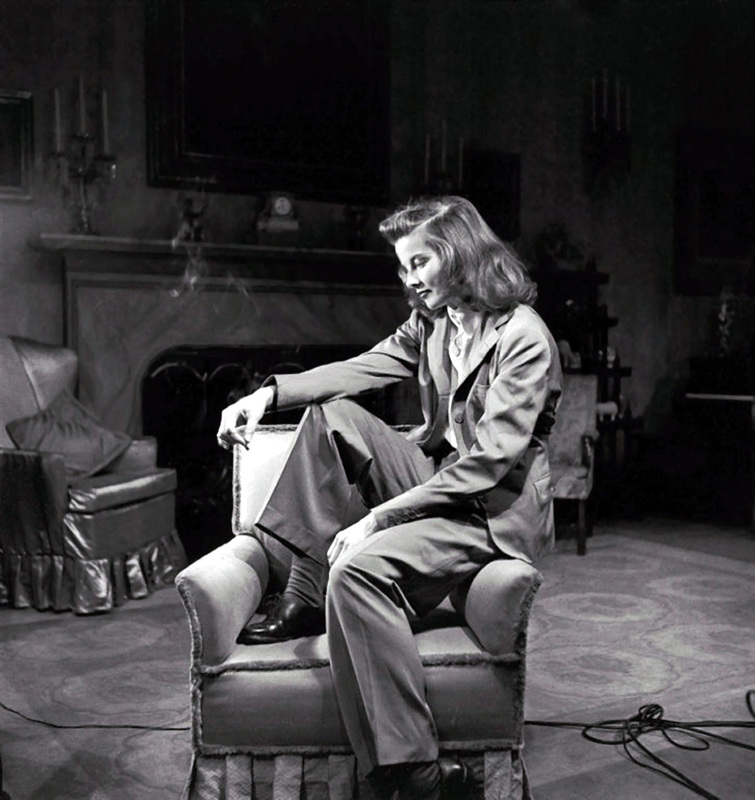 Katharine Hepburn on the stage set of The Philadelphia Story. Note: this list will only contain American films made between 1930-1970. It will exclude all foreign language films, and English films not made by the Hollywood studios (for example, I'm not going to consider Alfred Hitchcock's work before he came to America to make Rebecca in 1940). So, with that in mind, let's jump right in to the delightful romantic comedy, The Philadelphia Story (1940). The Philadelphia Story is about wealthy heiress Tracy Lord (Katharine Hepburn), who is from one of the oldest families in Philadelphia society. Tracy divorced her first husband (Cary Grant) after a tumultuous marriage, and now she plans to wed a blandly handsome coal-mining magnate (John Howard). Tracy's love life has attracted a lot of media attention (socialites were a staple of thirties and forties fan magazines), and a cynical tabloid reporter (James Stewart) and ace photographer (Ruth Hussey) are planning on crashing Tracy's much publicized second wedding. 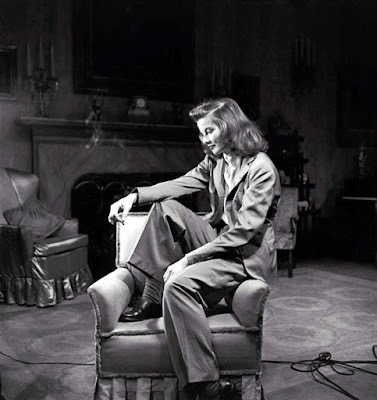 Katharine Hepburn in one of Adrian's gorgeous creations for The Philadelphia Story (1940). 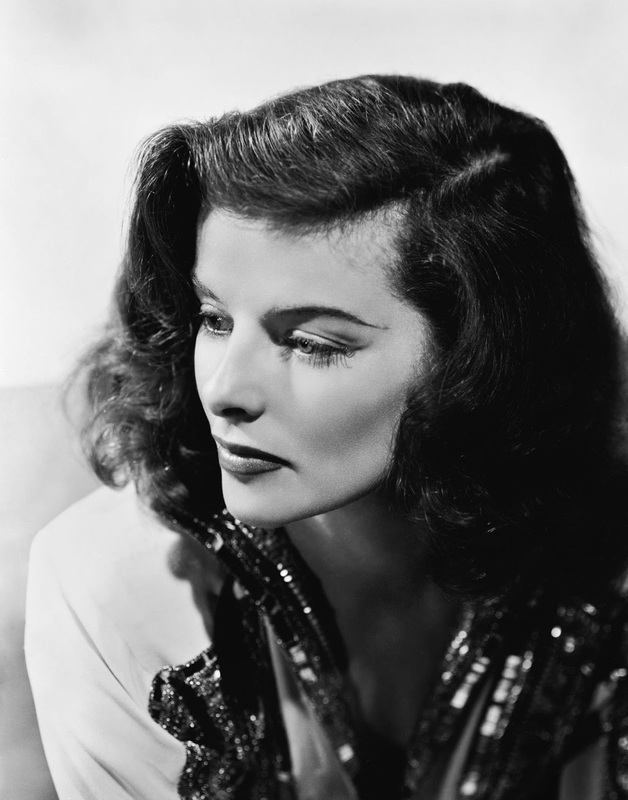 The Philadelphia Story was a major comeback film for Katharine Hepburn. She made a big splash in Hollywood in the early 1930's, quickly garnering major press attention and an Academy Award, but Hepburn's career slipped as the decade wore on and the public tired of her typecasting in haughty, patrician roles. The ever-indomitable Hepburn bought out her contract with RKO Pictures and returned to her home in Connecticut, where she worked with noted playwright Philip Barry to create her comeback vehicle. The Philadelphia Story, which was based on the real-life antics of socialite Helen Hope Montgomery Scott, is tailored to showcase Hepburn's talents and her beauty. The play was a huge hit, first on a nationwide tour and then on Broadway, and Hepburn successfully sold the film rights to MGM, where she was reunited with her favorite director, George Cukor, and Grant, who was her frequent co-star. 1. The sparkling dialogue. 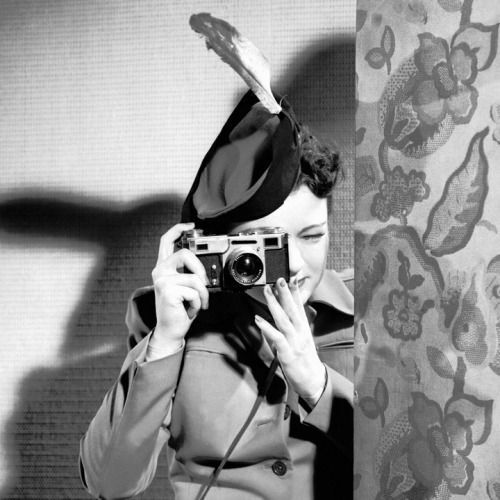 The Philadelphia Story is filled with some of the wittiest repartee in old Hollywood history (Donald Ogden Stewart reworked Barry's play for the big screen), but nobody gets better lines than Hussey as wisecracking tabloid photographer, Elizabeth Imbrie. 2. Hepburn. The independent star is an icon for women's rights, but she showed a tender, vulnerable side in The Philadelphia Story that won audience's hearts and set the template for her many films with Spencer Tracy. 3. Stewart. The actor won an unexpected best actor Oscar for his role as jaded reporter Macaulay "Mike" Connor. Many think this was something of a make-up award because he didn't win in 1939 for his stellar work in Mr. Smith Goes to Washington, but he is superb here, especially in a drunk scene he shares with Grant. 4. Adrian's costumes. Hepburn was at her most beautiful in the legendary designer's stunning creations, but Hussey also looks amazing in her tailored suits. 5. Virginia Wiedler. This child star who plays Tracy's younger sister steals every scene she's in, especially when she belts out the best version of "Lydia, the Tattooed Lady" this side of Groucho Marx. Ruth Hussey as ace photographer Elizabeth Imbrie in The Philadelphia Story (1940). Other critics: The Philadelphia Story has a rare 100 percent rating from Rotten Tomatoes and Leonard Maltin calls it "talky, but brilliant," in a four-star review for his Classic Movie Guide. Critics in 1940 were equally enthusiastic. It was named the second best film of 1940 by the New York Film Critics Circle and Bosley Crowther of The New York Times wrote that The Philadelphia Story "has just about everything a blue chip comedy should have." The Philadelphia Story is No. 51 on the American Film Institute's list of great movies. The bottom line: Maltin's right: The Philadelphia story is too talky, and it sags a bit in the final third of the movie, but it more than makes up for these minor shortcomings with a sparkling cast at the top of their game and MGM's luxe production values. This enduring romantic comedy is one of the best ways to begin a lifelong love affair with old Hollywood films. Availability: The Philadelphia Story is available on DVD and video on demand. Next Monday, I'll tackle The Philadelphia Story's musical remake, High Society (1956).